All students have access to our ultrafast broadband and a robust and secure Wi-Fi network to support and enhance their learning. While it will not be compulsory, we would like all students to bring their own learning device to school every day. Rongotai College has changed our learning programmes to make use of a number of eLearning tools. Each student will have their own school Gmail account, access to course material and GOOGLE Docs. Students are able to access their timetable, results and other details through our portal. They are also able to print from their devices through our online print service. Students use cloud storage within the Google environment and may also use Dropbox and SkyDrive to store their documents. Our Website also provides parents with a “Parent Portal” that allows them to become more involved with their child’s progress at school. By going online, parents are able to view student timetables, up to date attendance data, course details and student results. Education has changed significantly in recent years. BYOD has transformed the classroom by creating new opportunities for learning. Studies have found that the millennia generation is highly reliant on wireless devices and phones; rather than fight it, we can use this to educational advantage. Since many students already own a digital device by the time they reach secondary school, it’s a resource that can and should be used in the classroom. 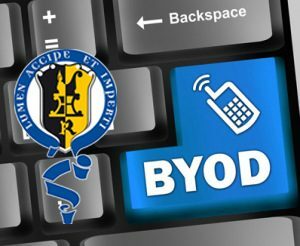 Much like calculators and ball point pens for previous generations, it has taken time for schools to accept the BYOD trend, but it is becoming commonly accepted in New Zealand and all over the world. We have no intention of becoming a “paperless” school! We still believe that it is important for students to use pen and paper and also for students to interact face-to-face without technology. This move is necessary if we want to provide the best possible education using the best possible tools! We want to use the most effective technology available for learning. We believe most schools are moving in this direction and within a few years we will certainly be in the minority if we don’t. We would like to think that Rongotai College is a forward-thinking, future focused and innovative school – we need to continue to push the boundaries and be a leading school in this area. Why does BYOD make sense for Rongotai College? Technology can make learning more fun and engaging! Teachers and students might supplement learning by a range of new relatively methods such as creating podcasts, using a software polling tool, or designing a digital scavenger hunt. The interactive nature of BYOD hones in on student learning. Digital books often include free supplemental resources, such as study guides, chapter outlines, and interactive tests that monitor progress and provide immediate feedback. Collaboration is enhanced by using device-neutral, browser-based applications. Students are able to work with classmates during school hours and they are also able to collaborate on homework. We have found that students commenting on each other’s work and giving each other feedback has been a powerful tool to enhance learning. Teachers can use media to meet different learning needs. BYOD allows students to be in control of their learning. Many technology tools can help extend gifted students who can, for instance, research more advanced material, while students who need more support or practice can do so individually. BYOD makes collaboration easier. Research can also be done faster and more often. More diverse sources of information can be used to support learning. The alternative seems archaic: Only use textbooks? Dictated notes? Go back to microfilms? Teachers can educate students about how to evaluate and find the best resources in a particular field. Students can use communication features to engage in projects that require contacting the community or local leaders. In fact, the millennia generation are more likely than any other generation to contact people from outside schools to discuss issues or get information. Students can apply learning to real scenarios, and get involved with real life learning situations. Teachers have the responsibility to prepare the millennia generation to enter the workforce. Teaching students to use digital devices is necessary as technology is blurring the line between work and recreation. More and more workplaces choose to operate a combination of working at home, or using after work hours to answer emails or attend to lower priority tasks related to their work day. Practice with BYOD in school will better prepare students to have a healthy work and life balance.